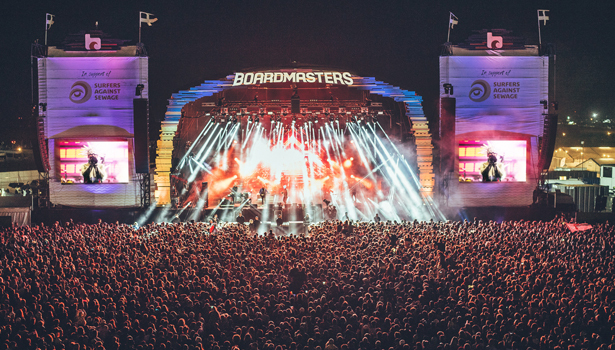 Boardmasters has today announced the return of its hugely successful beach cleans. In partnership with Surfers Against Sewage, the ‘Big Autumn Beach Clean’ will take place on 27 October 2018 on Watergate Bay and Fistral Beach as part of continued efforts and tremendous ongoing work to protect the oceans, beaches and coastlines in the UK and beyond. Boardmasters is now looking for volunteers to register for free here to participate and help protect the Cornish coast. This follows the ‘Big Spring Beach Clean’ in April this year, which saw hundreds of local volunteers join forces with Boardmasters and Surfers Against Sewage to clear plastic and general waste from two of Cornwall’s most beautiful beaches. 200 kilos of marine litter was collected over the weekend, with 57kg of plastic pollution cleared from Fistral Beach on one day alone, where over 40% of the rubbish collected was avoidable plastic. Later this month, Boardmasters, Surfers Against Sewage and members of the general public will be joined by Plastic Free Newquay, who will also be on hand to collect litter across both sites. The organisation assisted in April, going on to work with local school pupils to create an installation made from marine litter for Newquay’s Art8 Festival. It was announced earlier this month that Newquay has officially been named a ‘Plastic Free Community’ by Surfers Against Sewage, celebrating efforts to use less plastics and participating in local beach cleans. Boardmasters and Surfers Against Sewage (SAS) have worked together for over fifteen years to develop and implement sustainability and environmental strategies for the festival and its stunning surrounding areas. This includes Boardmasters’ litter bond on 50,000 camping tickets, 2018’s brand new reusable cup scheme, huge efforts to reduce single use plastics on site, the annual post-event clean up, beach cleans and much more. Year on year, these initiatives have gone from strength to strength, making positive changes to the local environment and festival site. Last year, Surfers Against Sewage was the largest beneficiary of the Boardmasters Foundation, receiving £20,000 to support their invaluable work protecting Britain’s coastline. It was also announced earlier this year that SAS had been selected by the Duke and Duchess of Sussex as one of the chosen charities to benefit from their wedding gift money. Volunteers can register for free here to take part in the ‘Big Autumn Beach Clean’ with Boardmasters and Surfers Against Sewage. Highlights from the ‘Big Spring Beach Clean’ here. Five Day Camping, Deposit and Payment Plan Tickets for Boardmasters 2019 are on sale now via the website, with line up announcements coming soon. Photography: Alex Rawson (Boardmasters Festival).